As Texas goes to Hell, a group of homeless outcasts--led by a young woman who appears to have second sight--evade volcanic eruptions, mass hysteria, and man--eating monsters. When the B.P.R.D. take notice of this, the results turn out to be deadly. Written by Mike Mignola and John Arcudi, and drawn by Eisner award winning artist Guy Davis, B.P.R.D. 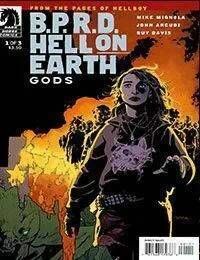 : Hell on Earth--Gods is the first arc of the pivotal Gods and Monsters saga. A B.P.R.D. arc unlike any other, jumping around in time, and introducing important new characters!